The municipality of Žumberak (1,185 inhabitants in 2001, 8 in the village of Žumberak) is located west of Zagreb and south of Samobor, towards the Slovenian border in the relatively low mountains of the same name. The administrative organization in the area is somewhat dim, since there where several changes in the mid 1990s, combining and recombining the territories of the neighbouring municipalities of Krašić and Sošice. Žumberak is one of those few municipalities in Croatia that have their administrative seat in a settlement of a different name than the municipality iself, here the village is Kostanjevac (102 inh.). Žumberak iincludes the only compact area in Croatia where there are relatively numerous members of the Greek-Catholic Church. The Catholic community preserving the Eastern Orthodox rite, but recognizing the authority of the Pope, organized in its own diocese in Croatia, with the seat of the Bishopric set traditionally in Križevci, though there are almost none of his followers in that area. Beside the population of Žumberak, there are occasional smaller groups in Slavonia, that are mostly Ukrainians and Ruthenians settled relatively late. 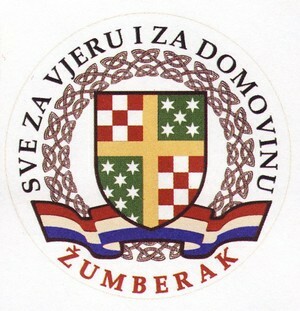 The symbols of Žumberak are prescribed by Decision Odluka o grbu, zastavi i svečanoj zastavi (Općine Žumberak), adopted on 18 June 1999 by the Municipality Assembly and published on 15 July 1999 in the Zagreb County official gazette Glasnik Zagrebačke Županije, No. 11. Decision Odluka o izmjeni i dopuni Odluke o grbu, zastavi i svečanoj zastavi (Općine Žumberak), adopted on 15 December 1999 by the Municipality Assembly and published on 15 February 2000 in Glasnik Zagrebačke Županije, No. 2, changes some technical details in the rules of use of the flag and penal prescriptions. The flag of the municipality of Žumberak is of rectangular shape in proportions 1:2, blue with the coat of arms of the municipality of Žumberakk in the centre, outlined with a thin golden-yellow edge. The ceremonial flag has along its edges a golden-yellow fringe and golden-yellow ribbons on both sides. The coat of arms of the municipality of Žumberak is in a shield shape, green, covered with white six-pointed stars. The symbolic of the coat must refer to the scattered villages (silver mullets) in the green nature - the region is rich with well-preserved natural forests (part of it is also a nature reservation). The Municipality Statutes claim that "the coat of arms of the municipality of Žumberak is the historical coat of arms of the municipality of Žumberak". I am not aware of the existence of such an item and I am not even sure that there was ever a municipality of Žumberak before 1997. The coat of arms used, without any formal adoption, by Žumberak before the current design (image) is quartered by a cross or, chequy gules and argent and vert semee of mullets argent. The first symbols of Žumberak were prescribed by Decision Odluka o grbu i zastavi Općine Žumberak, adopted on 19 December 1996 by the Municipality Assembly and published on 21 April 1997 in the official gazette of the town of Jastrebarsko Službeni vjesnik Grada Jastrebarsko, No. 2 (text). The flag is described in Article 7 as "green, in proportions 1:2, bordered golden-yellow, and with the coat of arms in the centre." In shield shape outlined with a golden line. On the right side a cross depicted golden in wattle shape, and around it 32 six-pointed golden starts. On the left side of the coat of arms chequy fields. The background of the shield is blue.